Kaltenbach is a small village in the Ziller valley, but the connection of the Hochzillertal ski area with Hochfügen has pushed the ski area into the top ranks of the Tyrolean ski areas and, along with the improvements in neighbouring areas, made the Ziller valley a "don't miss" destination for a ski holiday in Austria. 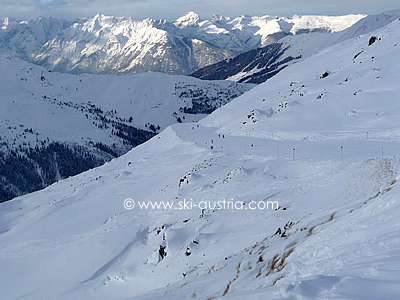 Note that the skiing in Hochfügen is covered here, but the skiing on the Spieljoch directly above Fügen is covered on the Fügen skiing page. 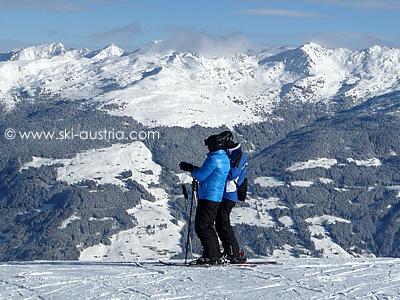 Like many other resorts in the Ziller valley, Kaltenbach has invested heavily in the access to its ski area. The main gondola station now has a massive covered and open parking area easily accessible off the main road and a second gondola means that the uptake of skiers has been tremendously improved. The top gondola station reveals a number of attractive bowls, pretty much above the treeline, and a number of beginner- and child-friendly clustered around the building. 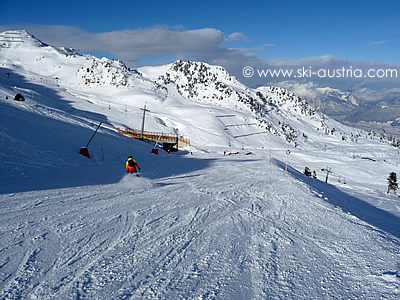 Those who want to get right on with their skiing can do worse than heading down the long motorway run past the beginners lifts to the left and to the base of one of the chairlifts that it passes. The Schnee Express is a heated eight-seater chairlift which provides access to the ridge and to the lifts further off to the left - the Öfelerbahn chair and the two Panorama draglifts. 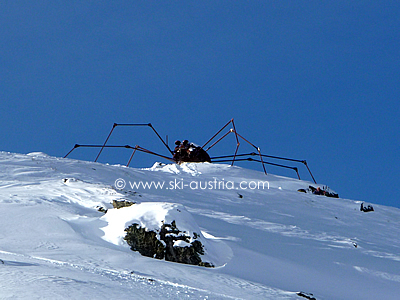 These offer interesting intermediate runs and a lovely panorama - as the name suggests - off the back into the Ziller valley further to the south (as well as a metal sculpture of an oversized spider looming over the runs!). 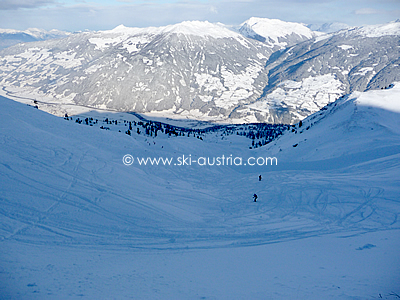 From the bottom of this section of the area, the new valley run - it is a black ski route - to the village of Aschau is open in good conditions and this is connected via ski bus to the main lifts. Otherwise access to the rest of the area is regained by the Schnee Express or by the popular "Z" blue run, which traverses from one side of the Kaltenbach bowls to the other. Just over from the Schnee Express, the Krössbichlbahn chairlift offers a section of harder black and red runs, while another of the wider high-speed lifts, the Sonnenjet, has some interesting reds and connects into the slightly orphaned Neuhüttenbahn chair to the right of the gondola station. 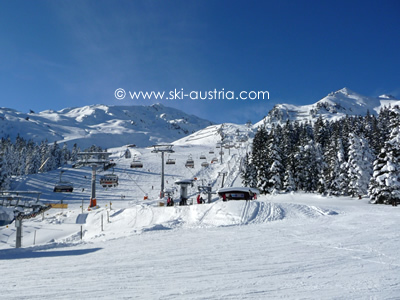 The Neuhüttenbahn chair is a favourite for off-piste skiers when the snow is right and once again offers a couple of more challenging runs. The top of the Sonnenjet is also the way over to the connection with Hochfügen. 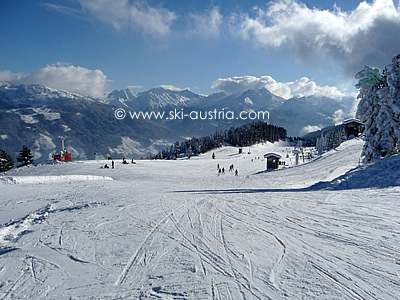 The connection lies in an intervening valley via the Topjet (to get back to Kaltenbach) or the Wedelexpress (to go over to Hochfügen) chairlifts, which also have a couple of black runs off to the side of the main intermediate routes. The long run down into the Hochfügen valley can be taken on a number of red routes - anyone who enjoy that side of the mountain can repeat some of the variants either via the Zillertal Shuttle gondola or the Holzalm chair. The route into the main Hochfügen bowl is either via the 8er Jet gondola or the Pfaffenbühel chairlift. 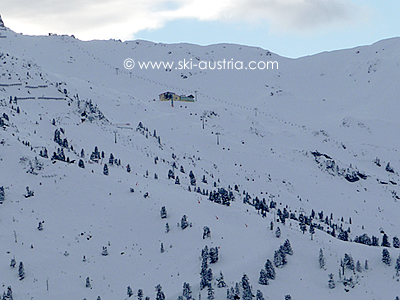 There are a number of difficult black and off-piste routes visible under those lifts but the main Hochfügen area offers open red and blue runs along the Pfaffenbühel draglift or the Hochfügen 2000 chairlift. 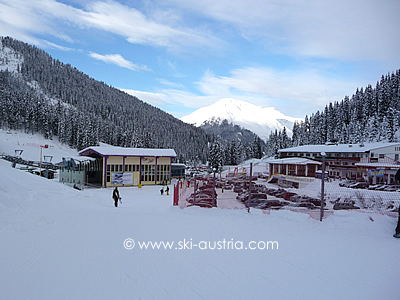 Down at the base near the parking area there are also five draglifts which are useful for beginners to practice on. 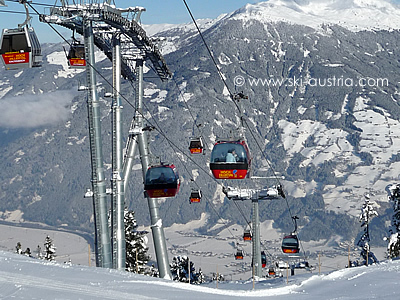 The journey back to Kaltenbach is taken via the Zillertal Shuttle and the Topjet chairlift. 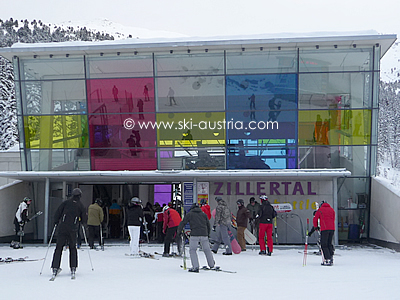 The top station of the two Kaltenbach gondolas. 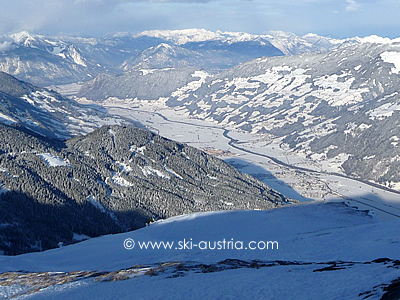 The live webcam stream below is taken from the 8er Alm lift in Hochfügen. There are alternate webcams available for the Hochfügen area by clicking the arrows on either side of the stream.